So pretty! A statement piece really. The only thing is the ribbons that weave it together keep coming out. Bit it really is SO pretty! 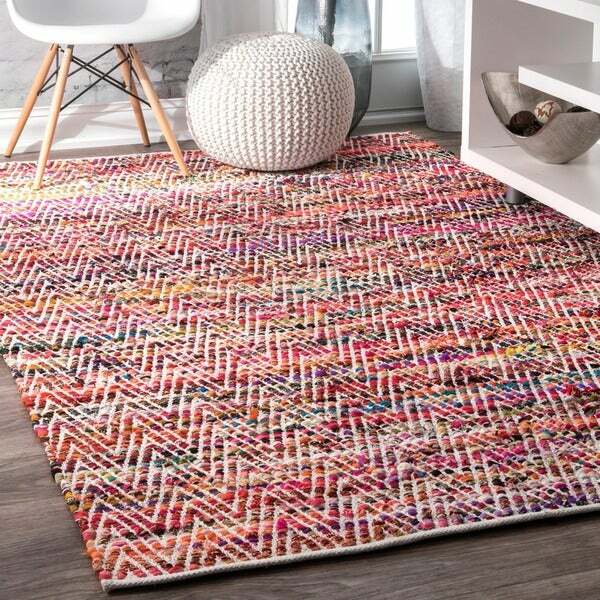 Beautifully handwoven with a colorful chevron pattern from cotton and polyester, this charming area rug from Porch & Den is a great way to bring a splash of color to your decor while also protecting your floors. The rug is latex free and flat-woven, making it easy to clean. I purchased this rug for my daughter's nursery, but when I opened it, there were several pieces of the rug not fully woven so the rug was coming apart. This rug is woven of several pieces of fabric, and some of the pieces coming apart would definitely have been a choking hazard!! Would not recommend this rug at all - it looks like it's made of unwanted scraps and the color was atrocious, nothing like the photos. Option: magenta - 7' 6" x 9' 6"
I was pleasantly surprised by this rug when I opened it up. The colors are rich and bold. The chevron pattern adds great character too. It is very soft and comfy underfoot. I love to travel and this rug speaks to my wanderlust side! It lays flat almost immediately and is a nice thickness. It will need a rug pad to stop it from slipping on hard surfaces. It adds a fantastic pop of color to my dining room! I would order this rug again in a heartbeat. Great value! This rug is very heavy and the colors are beautiful. I highly recommend this rug and it is very attractive in my den. This rug arrived very quickly and was wrapped well. First off, let me say that all the beautiful colors in this rug are the #1 reason we purchased. The photo is a little inaccurate. The photo shows it as more of shades of green, but in real life, there's a much larger variety of colors (I didn't mind because I love bright colors). I suppose I should have realized that this rug was delicate. It was only a matter of days before my dog's nails had caused some pulls. Combine that with the fact that this rug was in the most-used room in our house and it didn't stand a chance. It's also not easy to clean because things (pet hair, pine needles from Christmas tree, etc.) get stuck in it, and vacuuming seems to degrade the rug even further. If you don't have dogs/cats, aren't putting this in a high traffic area, and don't need to vacuum it often, this rug might be for you! If you're putting on hardwood floors, you'll definitely need a no-slip mat underneath it. Perfect for child's bedroom. 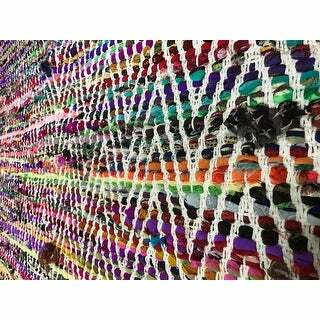 Multi colored fabric scraps woven together with magenta predominant. Makes it fit nicely with most decor choices but also be remarkable on its own. Definitely needs a non slip rug pad underneath though. Love the chevron stripes! Very pretty colors and very bright. It took a bit to get used to the brightness. The material is woven and some pieces tend to stick up but it really just goes with the look. 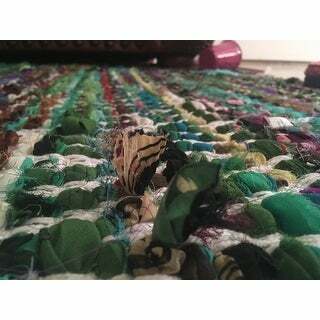 The rug is super soft and good quality. Great addition to brighten up a room! I love how bright and colorful this rug is. Other reviews are accurate—it looks like a bunch of scarves were stitched together to look like narrow stripes. I don't think it will be as durable as a high-quality woven rug, but it works well to brighten up a relatively low-traffic area. Rug looked nothing like the photo. it's made with strips of fabric and the strips are raveling. The ends of the fabric stick out all over. It looked so messy! The colors are very bright. Neon pink, neon orange, bright green. pretty vivid. 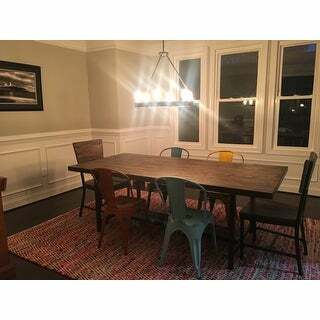 The rug I received is in NO WAY the rug that is pictured here. The picture shows a aqua/ green rug...the one i received is mostly brown and olive green. The main color is definitely brown and there is a lot of red in it as well. I like the look of the rug and don't want to pay to return it BUT it doesn't match anything else in the color scheme of my daughter's room and for that reason I am very disappointed. This rug was not as pictured, the rug in person is a bunch of scrap fabric that has been loosely made into a rug. The chevron pattern was spaced out almost twice as far than as pictured so that the fabric scraps hang out . This was originally purchased for a kids room, however it wouldn't last long if I decided to keep it. Option: Indigo - 8' 6" x 11' 6"
This rug added a really great pop of color to our living room, but there was no way to vacuum it without the pieces of fabric coming up. Even with just normal wear, it was falling apart after a few months. We ended up sweeping it to "clean" it while we had it and throwing it out when we moved -- not worth continuing to try to take care of it. This rug is very loosely woven and is not able to be vacuumed. The quality is pretty poor as it started unraveling pretty quickly and ended up in the Goodwill pile within three months. This came with several flaws and poor workmanship. 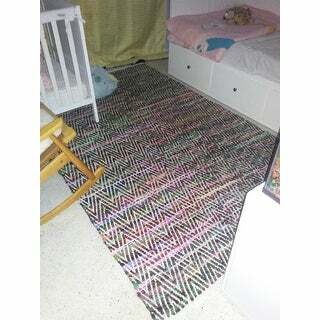 I am planning to return the rug, but I will re-order because I like the colors and design so much. They are perfect for my office. I received the new rug and I can use it with pride. No extreme flaws in this one. This rag rug has beautiful color and added a lot of fun to our room over looking beach at our lake house. Great price for a very large rug . Very satisfied with this purchase. completely comes apart, it's a mess after a couple of months of walking on it. Love this area rug. So bright and happy. Great fast shipping. Looks great under my dinning room table and chairs. The rug is already coming apart but the colors are vibrant and cheerful. My shoes keep getting caught on the rug and snagging it. It would be a great rug to put under the bed or kitchen table because it is not comfortable to walk on, too many knots. This rug is really pretty but likely will not hold up long. My dog is not destructive, but was just playing on the rug (she's 13 pounds) and the stitching/fabric pulled loose. 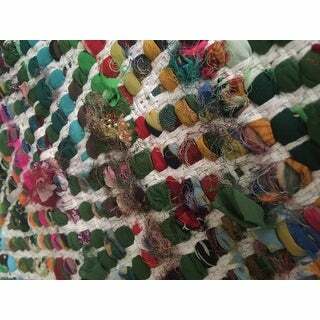 I loved the colors, the thickness and the cottage-y feel of this rag rug. It does look just like the photo. That said after the first wash, on gentle cycles, the rags started coming loose. Toe catchers, little loops of disaster. We had it on our kitchen floor (on a pad) and it looked FABULOUS, and we all tripped at one time or another. We tried sewing it (a lot) with thick carpet thread, and in the end resorted to cutting the errant fabric that made it look like a rag-shag rug. We still have it, it is just relegated to the floor in the kids basement guest room, something warm to sit on and play. They love it. I do just keep cutting it. The good news is that we do still have it, after several years, and it washes nicely, except for the problem stated, but there's so much of it, it might outlast me. The unraveling is tolerable--where it lives now, in a low traffic area. Def NOT a high traffic rug, and do not let an old person anywhere near it...hips will break! I don't hate it, and it still does look great where it is. My biggest pet peeve is this, by now, the manufacturers and distributors must be aware of the problem, if ours does this, so do others. Hello Overstock? The rug, as noted, could cause a serious fall. When I get a photo, I'll post it. "What is meaning of "as is"?" "As is" items may have been previously used or opened and could have blemishes, scratches, dings or dents. Your purchase may not arrive in the original manufacturer's packaging or include all original accessories. This item has not been reconditioned, but was inspected for basic functionality. Manufacturer's warranties are void. This item is sold 'as is' and cannot be returned. I hope it helps. The main thing I could find to justify the description was that it had been opened before coming to me. I don't know if it was returned or somehow opened at the warehouse. It is not as tightly woven as I would prefer, so I use the smaller vacuum I have on it. I don't want to risk damaging the rug with stronger suction. "Are these rugs machine washable?" "Can you use a vacuum on this rug?" Yes, we recommend you vacuum it on the lowest setting without the rollers. "Is this rug machine washable?" "Do you not ship this rug to RSA - Western Cape?" "Is this rug fairly soft so it could be washed in a washer & dried. I use it on top of our good rugs for the puppy. Thanks"
We do not recommend using a washing machine as it may warp the fibers.